This stylish two-bedroom Barcelona apartment has recently been renovated. It can be found very close to many of Barcelona´s top tourist attractions, including Las Ramblas. Although it has been completely restored, it keeps many of its original characteristics, such as the open-faced brick walls and wooden ceiling beams. With a capacity of up to four people, the two bedrooms in this lovely apartment are made up of four single beds: one room with two beds and ample storage space, and another room with a bunk bed. The living room is well-lit with large windows and it is equipped with a comfortable sofa and a large dining table. There is also a TV, and Wi-Fi so you can keep in touch with friends and family at home. The fully equipped American style kitchen has everything you will need to prepare your home-cooked meals. There is also a washing machine and iron for your convenience. 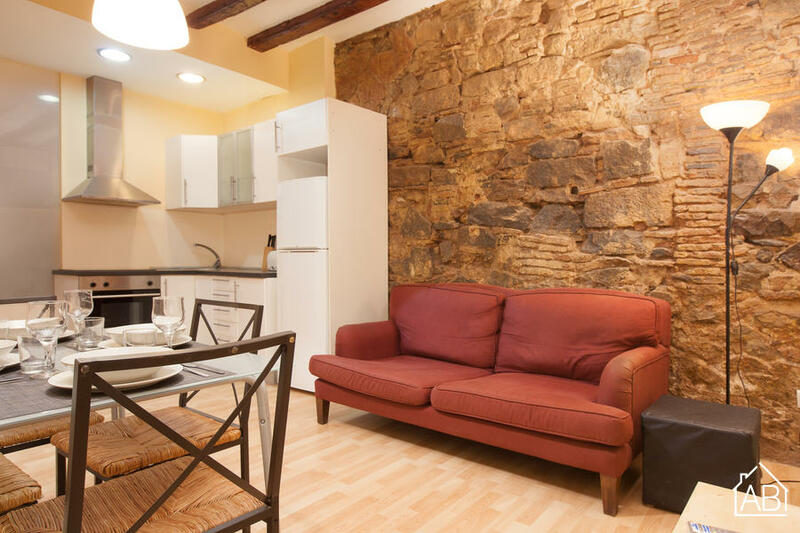 This wonderful apartment has air-conditioning and heating, which, along with its brilliant location, makes it a great choice of accommodation in Barcelona for a family, group of friends (or colleagues on a business trip) at any time of year. Please note that this apartment is for families and clients over 30 years old.